VEWH - What is water for the environment? Water for the environment has been a part of policy in Victoria since the 1990s. It’s water managed to maintain the health of rivers and wetlands. Although it refers to any water in our waterways that’s good for the environment, we are concerned with water held under environmental entitlements. Though water for the environment can mean any water in a river or wetland that benefits the environment, when we talk about 'water for the environment' (or 'environmental water') we are referring to water that's set aside in storages such as reservoirs and dams which is managed for plants and animals. Many of Victoria's river systems have been modified as the state has prospered and population grown, to provide water important for towns, industry and food production. Instead of water flowing naturally through the landscape, water is now captured in dams and weirs, and then delivered via pipes and man-made channels. As a result, some of our rivers give up more than a third – and sometimes half – of the water that would have naturally flowed in them throughout each year. Instead of flowing naturally, with high flows in winter and low flows in the hotter months of summer, rivers now run higher when water needs to be delivered for farming and urban use. These changes have interrupted many of the natural river and wetland processes needed by native plants and animals to survive, feed and breed. Water for the environment is released into some of these rivers and wetlands to improve their health and protect environmental values. In rivers, water for the environment can be delivered to mimic some of the flows that would have occurred naturally before rivers were modified. Water for the environment does not try to return rivers and wetlands to their pre-European condition. Many rivers and wetlands are so modified that this is not feasible; however environmental watering can help to minimise some of the impacts of these modifications on rivers and wetlands. Managers of water for the environment generally focus on returning some of the small and medium-sized river flows important in the life cycles of native plants and animals. In wetlands, water for the environment is focused on mimicking some of the natural wetting and drying cycles which plants and animals depend on for their diversity and long-term resilience. It's not simply the amount of water flowing in a river that's important. It's the entire environmental flow regime that matters, including the volume, timing, duration, frequency and quality of flows that are provided. Like the natural flow of rivers, different combinations of these provide a range of benefits for ecosystems. Releasing small amounts of water, called 'freshes', through summer helps to maintain or improve water quality. Flooding in spring replenishes a river channel and provides soil and nutrients for floodplains, as well as being vital for waterbirds and native fish to breed. Flows are characterised by their size, frequency, timing and duration. No discernible flow in a river.Total or partial drying of the river channel. Drying is important for some ecological processes. It can also reduce exotic pests such as European carp. Low flows generally provide a continuous flow through the channel. This may maintain the flow above a cease to flow, or provide habitat as a change from high flows. Connects in-stream habitats and can benefit other river users, such as providing water for livestock. Small pulses of water. These flows exceed the low flow and last for at least several days. Freshes are a key contributor to the variability of flows. Helps maintain or improve water quality and prevents algal blooms. Persistent increases in the seasonal base flows that remain within the channel. 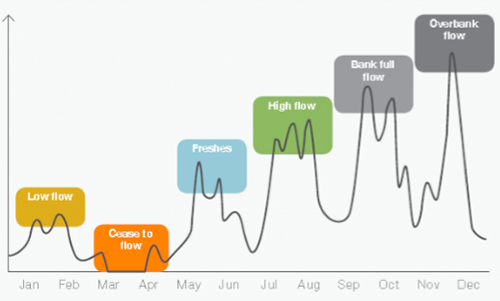 High flows do not fill the channel to 'bankfull'. Allows for fish migration and enhances recreational fishing opportunities. Flows that reach the top of the river bank with little flow spilling onto the floodplain. An important trigger for fish breeding. Helps move sediment and maintain banks. Flows greater than bankfull, inundating adjacent floodplains. Environmental water is not released for overbank flows on private land without permission from landholders. Overbank flows are critical for a range of ecological factors, including floodplain productivity.